First Line: "Chief Superintendent Harman! Ms Harman!" So near and yet so far. Counting the few remaining days until her retirement, Detective Chief Superintendent Fran Harman is asked to fill in for a colleague who's undergone triple bypass surgery. All she has to do is oversee investigations into a rash of happy slappings (unprovoked attacks on individuals made in order to record the event on video phones) and minor assaults. Initially taking a backseat in these matters, due to the media frenzy it's not long before Fran is right in the thick of the action. Unfortunately she's spending as much of her time in an attempt to control the media as she is in trying to catch the criminals. The local reporter who broke the story has personal reasons for taking such an interest in the case, and as the crimes begin to intensify, there's no way Fran Harman is going to retire until she can resolve everything. "Is it true, Chief Superintendent Harman, that they've brought you back out of retirement to investigate these cases?" "Golly, did I forget to park my Zimmer frame properly?" She looked about her in comic distress. "No, Ms Pound, I hadn't retired and have no immediate intention of doing so." But this woman deserves retirement. For the first time in over twenty years, she's free to do as she pleases. Her children are grown and living their own lives. She's no longer spending every weekend caring for her aged parents. Moreover, she has a man in her life whom she loves dearly, and she'd like to be able to concentrate on their life together. The investigations aren't solved by brilliant flashes of insight or marvels of deductive reasoning; they're solved by hard, dogged policework. Fran is in her element, although she does have to deal with a journalist who's such a timid blockhead that Fran doesn't know whether she wants to shake or slap Ms Dilly Pound-- and having the man she loves also be a police officer can put a crimp in her hands-on investigative style. 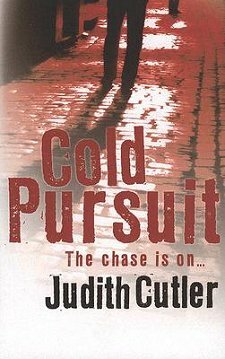 Reading Cold Pursuit lets you get to know an extremely talented police officer in her element. It's too bad Fran Harman can't be cloned and put in police forces around the world. She does indeed sound like a detective we need to have more of. Happily, I also found one of those series the other day. What I thought was that I wanted to have her as a friend. Not something that happens often in fiction. Dorte-- No, that doesn't happen very often. Fran Harman would make a good friend now that I think about it.